One of the biggest updates found within the iPhone 6s and 6s Plus is the ability to create Live Photos: tapping a photo can bring to life just a few seconds of that scene in action, with people setting up to smile or dogs fidgeting for the camera. 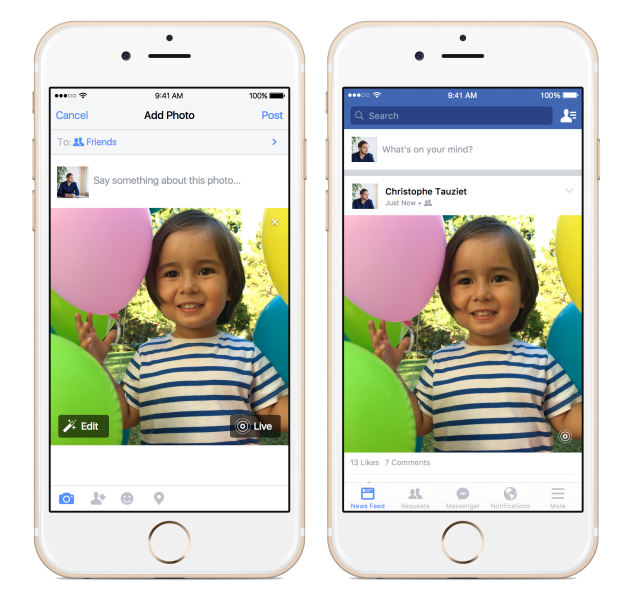 iOS owners will be able to see those Live Photos in Facebook, as the company announced today that it will fully support the feature within the mobile app. Facebook makes the UI for uploading Photos identical to its current process, but when it does load up there will be a little ‘Live’ icon that needs to be toggled to allow the feature to work. That icon is also what you must tap to make the photo come alive — with nearly two seconds of audio and video — within the app. The feature will be viewable for any iPhone running iOS 9, but Live Photos can still only be uploaded if you’re a 6s or 6s Plus owner. A lucky few will be able to see and load Live Photos starting today. The rest of us, unfortunately, will have to wait until the new year.